The smoker cookers in the 48 inch series all have 1/4″ rolled plate steel body, plate drip and firebox. Handles are 3/8″ thick strong back. Following are some questions sent from Tim, someone looking into purchasing a Lang 48 Hybrid. Ben Lang answers Tim’s questions and shares the information with you. QUESTION: Can the 48 delux hybrid be ordered on a trailer? ANSWER: Yes, the 48 hybrid Lang BBQ Smoker can be put on a trailer. However we build a 48 deluxe with a 24 ” chargrill and have one headed to paint. A short customer appreciation story with an overseas client. 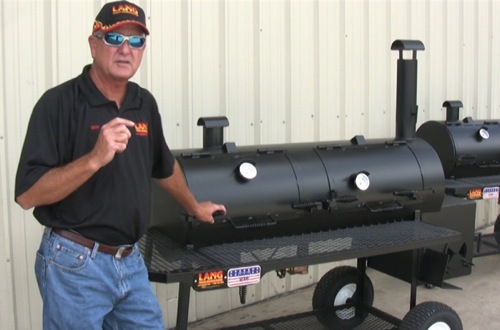 In October of 2011, Mr. Parphilios Jahshan purchased a 48″ patio model smoker cooker and had it shipped to North Carolina. When he noticed that his credit card was over billed by $100 he emailed Ben Lang about the situation.